I have been outmatched by the power of this CD. When it came out, I rushed a short paragraph about it onto the amazon.com site: "Brave Old World has been performing this cycle of music based on songs written by Jews in the Lodz Ghetto during WWII. The rolling cadences of the band's music, and Michael Alpert's amazing voice make this a 'must have' recording for anyone interested in wonderful, life-affirming Jewish music. Brave Old World have never sounded better—which given what an amazing band they are, live and in concert, is no small feat. Those interested in music from the Holocaust will also regard this as essential, on part with Adrienne Cooper and Zalmen Mlotek's 'Ghetto Tango' released to great acclaim several years ago." But once I get into the details of the CD, I am too moved to write. Now, if only to accept the inadequacy of my own words, but at least to write something and move on, I will document a bit more, and move on. I won't stop listening to the CD. It is seared in my mind. I can't imagine someone aware of the Holocaust, or interested in Yiddish music, or looking for powerful, life-affirming responses in the face of a murder machine attempting to erase any such feeling, who doesn't already have a copy of this recording. Based on sales of the CD, that is not the case. I have work to do. We all do. The CD opens not with the band, but with Gila Flam's recording of Yakov Rotenberg, singing a song of defiance written by Yankele Herszkowicz. "the Angel of Death / Got to work right away / He makes a mess out of every here / He does it quickly / He does it well / He makes the whole ghetto weak and tired / Our Khayim is great...." From there, we move not into songs of the Ghetto, but, after an instrumental interlude, to wedding songs and tunes stitched together my Michael Alpert. Alpert's initial wedding medley is separated by another instrumental interlude and then he begins singing "Because I am a Jew," attributed on the "Ghetto Tango" album to Yankele Hershkowitz. It recounts the horrors of ghetto life, and then responds, "Because I'm a Jew / I sing this song...." In the face of death, the prophetic tradition lives on. And sometimes, in the face of horror, to report what is, and then to assert that one will sing, is sufficient prophecy. On other Brave Old World albums, the interplay between band members and the music they make together is the highlight. There is a moment in earlier shows, captured on "Beyond the Pale where after eons of intense music Alpert's voice suddenly appears out of seeming nowhere. In this program, the reverse is true. Alpert's voice carries most of the show, with briefer interludes of instrumental brilliance. In many ways, this album is also the culmination of decades of touring and playing by the band. As the songs reflect life, death, hope, despair, and always, always, sarcasm, satire, and defiance ("Es geyt a yeke" and its accompanying marching music, or "Amerika hot erkiert"), the band weaves in pieces such as their "Berlin 1990," a piece written 15 years earlier about being in a post-Holocaust country: "So sing, my fiddle / Play, my fiddle / Like no one has played before / And play me a sweet Diaspora song / Of pure longing …." It as if making these songs real and bringing them to modern audiences is, in part, the answer to why this band has transformed traditional Jewish music, and why it has been playing these decades. And that's it. This is music humanizing those murdered. No longer mere "victims," but, instead, people facing starvation, murder, and deportation and remaining human. But two generations have passed. We have had time to reflect on what it feels to be in Germany that is largely empty of Jews, and then to watch klezmer catch on among non-Jews (to the horror of survivors, few, if any of whom, counted klezmer among their immediate Jewish traditions) and transformed further by an influx of Jewish emigration from the former Soviet Union. We can never forget, but neither can we return to what was or change what happened, any more than we can forget sitting on the banks by the river of Babylon and weeping. Here in the United States, words about the Holocaust are transformed from Elie Wiesel's Night of two generations ago to Michael Chabon's fantasies in The Yiddish Policemen's Union and Anne Michaels' lyricism in Fugitive Pieces. 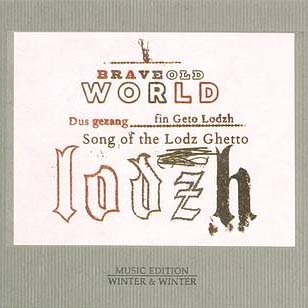 Brave Old World's "Songs from the Lodz Ghetto" is the musical equivalent of those books. What they have done, definitively, miraculously, is to capture that weeping, transform it, and transmit it to us, and for coming generations, so that we, too, will remember the bitterness, but also that in those times, many remained human, and through those times and beyond, we persevered. As I listen, again, I find myself back and forth between Alpert's pain in "Berlin 1990," the bitterness and satire of "Rumkovski Khayim," and the defiance and affirmation of "While I am a Jew." I need to stop. I will never stop writing more in my head, and will never be able to stop listening. Some readers of these pages do not yet have copies of this recording. I have spoken with the band about sales figures, and I know this to be true. It is time for you to act and to get your own copies. I can't say more. Reviewed by Ari Davidow, 20 Jan 2008. Pages copyright © 1995—2018 by Ari Davidow. All rights reserved. Last revised 20 January, 2008.